Robert W. Huigens III, Ph.D.
Robert Huigens received his bachelors in Biology from the University of North Carolina at Greensboro in 2003. He then pursued graduate studies in Chemistry at North Carolina State University under the direction of Professor Christian Melander. After earning his Ph.D. in 2009, he went on to become an American Cancer Society postdoctoral fellow at the University of Illinois at Urbana-Champaign under the guidance of Professor Paul Hergenrother. In 2013, Dr. Huigens joined the Medicinal Chemistry Department at the University of Florida as an assistant professor. His research interests include organic synthesis, drug discovery, medicinal chemistry, chemical biology, antibacterial agents and personalized cancer therapeutics. 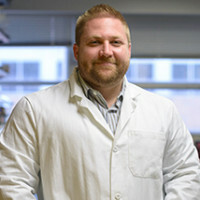 Recently, Dr. Huigens was the recipient of two Young Investigator Awards from the American Chemical Society (Division of Medicinal Chemistry) and the Center for Biofilm Engineering (Montana State University) for his group’s discovery of novel bacterial biofilm-eradicating agents. Garrison, A. T.; Abouelhassan, Y.; Kallifidas, D.; Tan, H.; Kim, Y. S.; Jin, S.; Luesch, H.; Huigens III, R. W. “An Efficient Buchwald-Hartwig/Reductive Cyclization for the Scaffold Diversification of Halogenated Phenazines: Potent Antibacterial Targeting, Biofilm Eradication and Prodrug Exploration.” J. Med. Chem., just accepted. Yousaf, H. H.; Garrison, A. T.; Abouelhassan, Y.; Basak, A.; Jones, J. B.; Huigens III, R. W. “Identification of Nitroxoline and Halogenated Quinoline Analogues with Antibacterial Activities against Plant Pathogens.” ChemistrySelect 2017, 2, 6235-6239. Yang, H.; Abouelhassan, Y.; Burch, G. M.; Kallifidas, D.; Huang, G.; Yousaf, H.; Jin, S.; Luesch, H.; Huigens III, R. W. “A Highly Potent Class of Halogenated Phenazine Antibacterial and Biofilm-Eradicating Agents Accessed Through a Modular Wohl-Aue Synthesis.” Sci. Rep. 2017, 7, 2003. Abouelhassan, Y.; Yang, Q.; Nguyen, M. T.; Rolfe, M.; Yousaf, H. Schultz, G. S.; Huigens III, R. W. “Nitroxoline: A Broad-Spectrum Persister Cell- and Biofilm-Eradicating Agent Against Pathogenic Bacteria.” Int. J. Antimicrob. Agents 2017, 49, 247-251. Zuo R.; Garrison A.T.; Basak A.; Zhang P.; Huigens III, R. W.; Ding Y. “In vitro antifungal and antibiofilm activities of halogenated quinoline analogues against Candida albicans and Cryptococcus neoformans.” Int. J. Antimicrob. Agents 2016, 48, 208-211. Basak, A.; Abouelhassan, Y.; Norwood IV, V. M.; Bai, F.; Nguyen, M.; Jin, S.; Huigens III, R. W. “Synthetically Tuning the 2-Position of Halogenated Quinolines: Optimizing Antibacterial and Biofilm Eradication Activities via Alkylation and Reductive Amination Pathways.” Chem. Eur. J. 2016, 22, 9181-9189. Hot Paper, Cover Art Selection, Highlighted in Angew. Chemie. Int. Ed. Garrison, A. T.; Abouelhassan, Y.; Norwood IV, V. M.; Kallifidas, D.; Bai, F.; Nguyen, M.; Rolfe, M. Burch, G. M., Jin, S., Luesch, H.; Huigens III, R. W. “Structure-Activity Relationships of a Diverse Class of Halogenated Phenazines that Targets Persistent, Antibiotic-Tolerant Bacterial Biofilms and Mycobacterium tuberculosis.” J. Med. Chem. 2016, 59, 3808-3825. Paciaroni, N. G.; Borrero, N. V.; Rocca, J. R., Huigens III, R. W. “Rapid Synthesis of Phenazine-1-Carboxyilc Acid Derived Small Molecules from Diverse Anilines: Privileged Structures for Discovery.” Research & Reviews: Journal of Medicinal & Organic Chemistry, 2015, 2, 67-76. Garrison, A. T.; Abouelhassan, Y.; Kallifidas, D.; Bai, F.; Ukhanova, M.; Mai, V.; Jin, S.; Luesch, H.; Huigens III, R. W. “Halogenated Phenazines that Potently Eradicate Biofilms, MRSA Persister Cells in Non-Biofilm Cultures and Mycobacterium tuberculosis.” Angew. Chemie Int. Ed., 2015, 54, 14819-14823. Abouelhassan, Y.; Garrison, A. T.; Bai, F.; Norwood IV, V. M.; Nguyen, M.; Jin, S.; Huigens III, R. W. “A Phytochemical-Halogenated Quinoline Combination Therapy Strategy for the Treatment of Pathogenic Bacteria” ChemMedChem, 2015, 10, 1157-1162. Garrison, A. T.; Bai, F.; Abouelhassan, Y.; Paciaroni, N. G.; Jin, S.; Huigens III, R.W. “Bromophenazine Derivatives with Potent Inhibition, Dispersion and Eradication Activities against Staphylococcus aureus Biofilms.” RSC Adv. 2015, 5, 1120-1124. Abouelhassan, Y.; Garrison, A. T.; Burch, G. M.; Wong, W.; Norwood IV, V. M.; Huigens III, R. W. “Discovery of quinoline small molecules with potent dispersal activity against methicillin-resistant Staphylococcus aureus and Staphylococcus epidermidis biofilms using a scaffold hopping strategy.” Bioorg. Med. Chem. Lett., 2014, 24, 5076-5080. Borrero, N.V.; Bai, F.; Perez, C.; Duong, B.Q. ; Rocca, J.R.; Jin, S.; Huigens III, R.W. “Phenazine antibiotic inspired discovery of potent bromophenazine antibacterial agents against Staphylococcus aureus and Staphylococcus epidermidis.” Org. Biomol. Chem. 2014, 12, 881-886. Huigens III, R.W. ; Morrison, K.C. ; Hicklin, R.W. ; Flood Jr., T.A. ; Richter, M.F. ; Hergenrother, P.J. “A ring-distortion strategy to construct stereochemically complex and structurally diverse compounds from natural products.” Nature Chem. 2013, 5, 195-202. Rogers, S.A.; Huigens III, R.W. ; Cavanagh, J.; Melander, C. “Synergistic effects between conventional antibiotics and 2-aminoimidazole-derived antibiofilm agents.” Antimicrob. Agents & Chemother. 2010, 54, 2112-2118. Huigens III, R.W. ; Reyes, S.; Reed, C. S.; Bunders, C.; Rogers, S.A.; Steinhauer, A.T.; Melander, C. “The chemical synthesis and antibiotic activity of a diverse library of 2-aminobenzimidazole small molecules against MRSA and multidrug-resistant A. baumannii.” Bioorg. & Med. Chem. 2010, 18, 663-674. Rogers, S.A.; Huigens III, R.W. ; Melander, C. “A 2-aminobenzimidazole that inhibits and disperses gram-positive biofilms through a zinc-dependent mechanism.” J. Am. Chem. Soc. 2009, 131, 9868-9869. Huigens III, R.W. ; Rogers, S.A., Steinhauer, A.T., and Melander, C. “Inhibition of Acinetobacter baumannii, Staphylococcus aureus, and Pseudomonas aeruginosa biofilms with a class of TAGE-triazole conjugates.” Org. Biomolec. Chem. 2009, 7, 794-802. Huigens III, R.W. ; Ma, L.; Gambino, C.; Moeller, P.D.R. ; Basso, A.; Cavanagh, J.; Wozniack, D.J. ; Melander, C. “Control of bacterial biofilms with marine alkaloid derivatives.” Mol. BioSys. 2008, 4, 614-621. Huigens III, R.W. ; Richards J.J.; Parise, G.; Ballard, T.E. ; Zeng, W.; Deora, R.; Melander, C. “Inhibition of Pseudomonas aeruginosa biofilm formation with bromoageliferin analogues.” J. Am. Chem. Soc. 2007, 129, 6966-6967.